I’ve spent years studying all this, and it still sometimes gets to me: just how flipping BIG the Universe is! And this picture is still just a tiny piece of it: it’s 1.2 x 1.5 degrees in size, which means it’s only 0.004% of the sky! 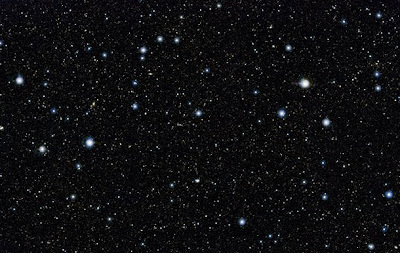 Considering the vastness of the universe, and our ability to study it, and to discover laws and constants that apply throughout its enormous breadth, should help us in our humility before God whose infinite wisdom created it. Even more, we should be humbled that the Logos through whom it was all created, deigned to become a man like us in all things but sin, to allow himself to be betrayed, to give Himself to us as food, to be tortured and crucified, to rise again in the flesh, and to remain for ever with us in the Church. We look in awe at countless galaxies, billions of light years away and then, for the sake of some trivial pleasure, sin against the one who created them, and who came to our little spot in the universe to suffer and die to win us heaven. I often think that the first reaction of most of us when we meet Our Lord and Saviour at the last judgement will be to cringe in agony at how stupid we have been.